Forest, emerald, deep moss, and seafoam greens blend together to give depth and dimension to our Emerald Isle Medical ID Bracelet. 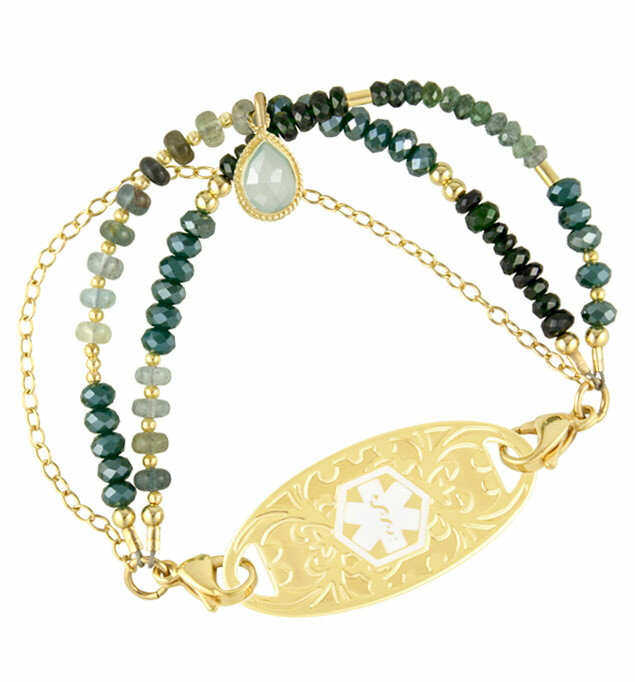 Two hand-crafted strands of tourmaline and aquamarine with gold accents balance a third strand of gold oval chain, all finished off with a pear-shaped seafoam chalcedony charm in a rope-detailed gold bezel setting. Interchangeable and chic, the Emerald Isle Medical ID Bracelet is a Lauren’s Hope Signature Style, exclusively designed and crafted in our Kansas City studio. As with all of our interchangeable designs, you can wear your Emerald Isle Medical ID Bracelet with any custom-engraved Lauren’s Hope medical ID tag, keeping what’s truly most important to you right at hand. This on-trend med ID is a great choice whether you wear your medical alert bracelet for epilepsy, lupus, hypothyroidism, Alzheimer’s, vision impairment, or any other medical condition or treatment consideration. Custom engraving allows you to choose the look you want so you can stay safe in style.